This is the perfect fall dress to toss on and instantly look chic and put-together with minimal effort. The Lines of Latitude Belted Stripe Dress is fully lined below the waist. The top is made of a stretchy fabric with horizontal black and white stripes. It has a rounded neckline and long sleeves. 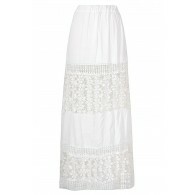 The attached skirt has a banded waist that gives way to the A-line skirt. An included brown belt wraps around the waist, creating contrast. A hidden back zipper completes this dress. 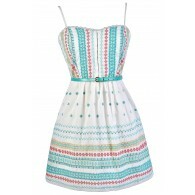 The Lines of Latitude Belted Stripe Dress would look nice paired with pumps or wedges. You could also dress it down with flat sandals or boots. This is a dress that looks great paired with tights in the fall and winter or worn alone on warmer days. Toss a fitted jacket over this on cool nights when you need more coverage. This is a cute dress you'll be able to style many different ways. Details: Skirt is fully lined. Belt included. Hidden back zipper. 95% cotton, 5% spandex. Contrast: 100% polyester. Lining: 100% polyester. Hand wash cold water. Do not bleach. Line dry. Iron low. Do not dry clean. Small measurements: Length from top of shoulder to hemline: 34". Bust: 30". You have added Lines of Latitude Belted Stripe Dress in Navy into Wishlist. 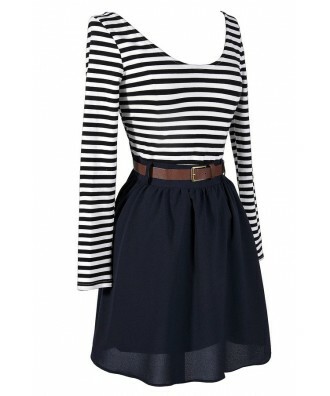 You have added Lines of Latitude Belted Stripe Dress in Navy for Stock Notification. 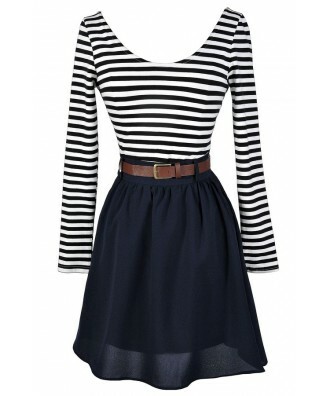 You have set Lines of Latitude Belted Stripe Dress in Navy as a loved product. 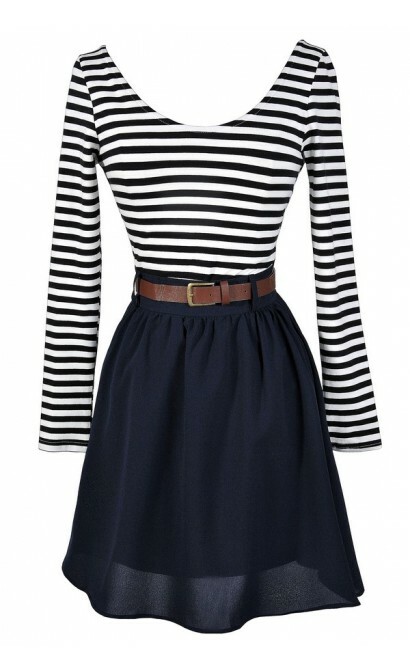 You have removed Lines of Latitude Belted Stripe Dress in Navy as a loved product.